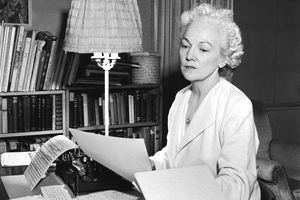 The American author Katherine Anne Porter (1890 – 1980) is best known for her work as a short story writer. She grew up in Louisiana and Texas and married at 16. In 1915, due her the abusive relationship with her husband, she divorced, but in the same year was also diagnosed with tuberculosis (eventually deemed a misdiagnosis - she actually had bronchitis), which put her in a sanatorium. It was there that she decided to become a writer. In 1918, after writing for various news outlets, she almost died in Denver, Colorado due to the 1918 flu pandemic. When she left the hospital, she was frail and bald, and when her hair eventually grew back, it came in white. Her hair was to remain this color for the rest of her life, and her experience of the trauma was reflected in one of her most famous bodies of work, the trilogy of novels "Pale Horse, Pale Rider." In 1919, Porter moved to Greenwich Village, making her living as a ghostwriter and writer of children's books. She soon left to work in Mexico City where she got involved in the leftist movement, but again returned to Catholicism after being disillusioned. Porter went on to marry and divorce three more men. She never had any children. She continued to write and publish, eventually becoming a member of the National Institute of Arts and Letters in 1943, and a writer-in-residence at several colleges and universities. In 1966 Porter won the Pulitzer Prize for Fiction for The Collected Stories, and in 1967 she won the Gold Medal Award for Fiction from the American Academy of Arts and Letters. She was nominated three times for the Nobel Prize in Literature. After reading her work, delve into Joan Givner’s biography, Katherine Anne Porter: A Life. From a writer’s point of view, it’s useful to see how Porter’s work evolved in the course of her life: what events influenced her work, how that influence manifested itself in the fiction, and what her writing process was like. It’s heartening, for example, to know that Porter often put stories and novellas aside for years before going back to revise them. For a sense of Porter’s personality, if not a factual account of her life, also read the Paris Review interview. How to find writing inspiration from photographs! Fiction writer Liz Prato on her new short story collection "Baby's on Fire"